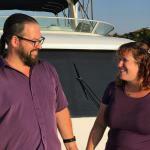 As full-time travelers, we’re living the dream! 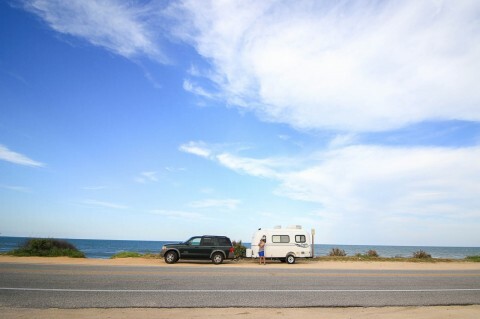 We’ve chosen a life of endless road trips fueled by the freedom to work as we go. One of the best perks of our lifestyle? We can change our office view at any time from the east coast to the west coast and all that’s in between. However, come tax season, our travels and working in many states may create more tax returns to file. Why? When we make income while working in states other than where we’re domiciled, we may be required to file additional tax returns such as a nonresident tax return. Each state we work in may have rules taxing nonresident’s income earned within their state borders. So, which states do you need to complete a nonresident state income tax return? It depends. It depends on your unique facts and circumstances and it depends on each state’s tax rules. Every state handles taxing nonresident income differently. In this article, we’ll show you how to do the research so that you can determine which states you may need to complete a nonresident income tax return for. Since each state approaches taxing nonresident income differently, it’s important to individually research each state you’ve traveled through and did work within. Also, be prepared for rules to change from year-to-year. Currently, states are working to figure out how to tax people that perform services using the internet. Not all states name their tax organization the Department of Revenue. It may be different like California’s Franchise Tax Board or New Jersey’s Division of Taxation. Once you find the tax rules for nonresidents, take your time and read them carefully. As a forewarning, these rules can be confusing and difficult to understand. When in doubt, call the state’s tax department and ask about your specific situation to gain clarity and peace of mind. The state may provide great news relieving you from completing an income tax return like Georgia did for Nubern. Or, they may affirm you must pay income taxes for performing services while in their state like California. Nubern feels he satisfies both statements, because he physically worked within Georgia and he is required to file a Federal income tax return. But, he’s still uncertain, so Nubern calls the GDR directly to get clarity. The GDR representative on the phone clarifies the state of Georgia’s definition of source income. If you are not domiciled in Georgia, Georgia will want an income tax return if you have some form of source income from Georgia. Source income from Georgia includes wages, Georgia lottery winnings, income from flow through entities, rents, etc. The GDR representative states that performing services through the internet while being physically present in Georgia is not defined as Georgia source income by the State of Georgia. In conclusion, the GDR confirmed Nubern does not need to complete a Georgia nonresident income tax return. However, Nubern would have never been able to determine this without making the phone call. Whenever you are uncertain, call and talk to a state representative explaining your specific situation so they can give you an accurate answer. He finds the California Franchise Tax Board (CFTB) details their rules on taxing nonresidents here. Researching California’s rules on their website is a step-by-step process. Together, we’ll walk through what the website explains below. First, the CFTB defines who is a California resident. Then, they affirm Nubern’s tax status as a nonresident by stating, “A nonresident is any individual who is not a California resident.” You can see this below. From this, Nubern’s new question is: What are California sources? The CTFB website answers this question as we work down the page. We’re given clarity on what California defines as source income when referring to compensation and business income situations. For folks receiving compensation through wages and salaries, California states source income is dictated by where the services are performed. They explain the source of income doesn’t matter where your employer is located, when your payment is issued or your location when the payment is received. In other words, California determines source income to be where you physically are while you are doing your income generating activity. Nubern continues reading down the website’s page and finds the CFTB states how they will tax him as a self-employed individual with Business Income. In this section, the CTFB states that any profession carried on within California borders is considered taxable California source income. In conclusion, Nubern needs to complete a California nonresident income tax return. The return will report the income he received while he was physically present in California and doing work that would result in any income for his business; even though he may have billed and received the income when he was outside California. First, this example shows how states define source income in very unique ways. Georgia and California use the same terminology of “source income”, but have different interpretations of the definition. The different interpretations show how Nubern’s same accounting services can be taxed differently by each state. Second, it’s important to know that being physically present within a state, for even one day, while doing business could have an impact on your requirement to file a nonresident income tax return. The other 48 states have their own nonresident tax rules and definitions to abide by. Next, we’ll show you how you can research each state’s rules yourself. Since each state handles taxing nonresidents differently, we have tips to help you be prepared for tax season. To determine if you need to complete a state income tax return, you may need to provide your facts of how many days you were physically present in a state and/or how much income you made while in a state. Include the dates and locations of your travels. Find an example travel log here. Income reports that detail how much income you made in each state. Keeping an accurate travel log and detailed income reports will save you time and stress of trying to remember a full-year’s worth of travels and income during tax season. What are the Best States to Travel and Work In? 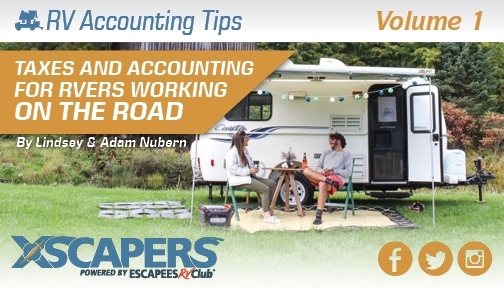 To avoid the complications of having to complete nonresident state income tax returns, you could strategically travel and work in states that don’t tax income. Now, that’s a unique way to plan a road trip! Also, Tennessee and New Hampshire do not tax wages or business income, but they do tax dividend and interest income. 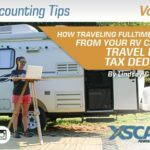 Every full-time RVer’s situation is different and tax law can be confusing. Consult your professional CPA with your unique situation to get more clarity on which states you need to complete nonresident tax returns.